One of the best rice dishes – ever! Often a centrepiece at parties, I can’t imagine a celebration without Jollof. 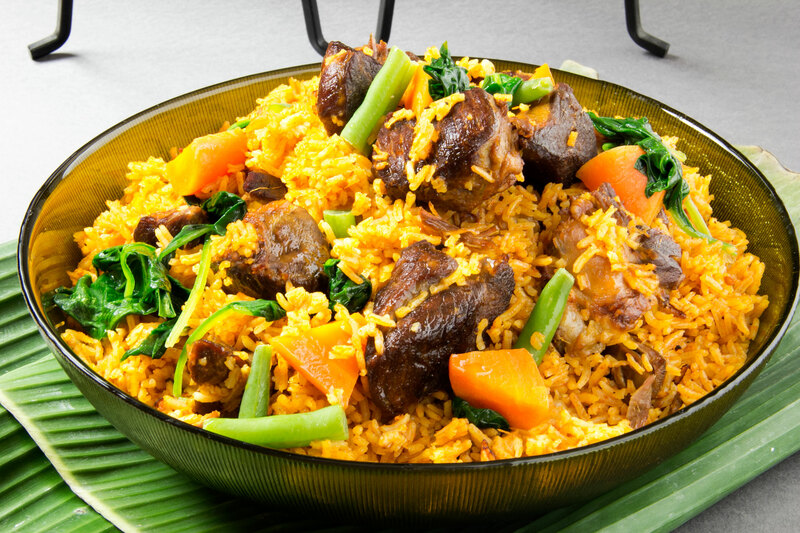 It is packed with flavour and is to West Africa what paella is to Spain, biryani to India and risotto to Italy. It’s delicious with just about any type of meat – lamb, mutton, beef or chicken – this dish speaks for itself. Here is my interpretation of mum’s interpretation of a classic, using a combination of lamb cuts for their aroma and flavour. Preheat oven to 200oC/fan 180oC/400oF/gas 6. Slice the lamb breasts into bite-size pieces, place on a rack over a baking tray and roast in the oven for about 20-25 minutes until brown, crisp and drained of fat. Remove from the oven and set aside. While the breast pieces are roasting, put the stewing pieces in a large saucepan with the onion, garlic, herbs, guinea peppers, stock cube, scotch bonnet and seasoning. Stir, cover and leave to simmer and steam in its own juices until the juices run clear. To create a stock, add enough water to just cover the meat and bring to the boil. Skim any froth that rises, then reduce the heat and simmer until the meat is tender. Remove the meat from the stock, place on an oven tray and brown in the oven, about 15 minutes. Add the breast, stewing pieces and Maa’s Tomato Sauce to the stock. Stir in the turmeric or curry powder and simmer for 10 minutes. Stir in the rice, add about 2 cups of water and bring to the boil. Reduce to a low heat, cover the pan with tin foil (to trap in the steam) and replace the lid. Simmer for 30-35 minutes, until all the liquid has been absorbed and the rice is tender and a luscious orangey-pink. Jollof has to be eaten immediately to get the best flavour. Serve with steamed spinach, carrots or green beans. As an alternative, serve with diced mango and avocado. No Replies to "Lamb Jollof Rice"